How do I get solder to stick to the thin ribbon strips? 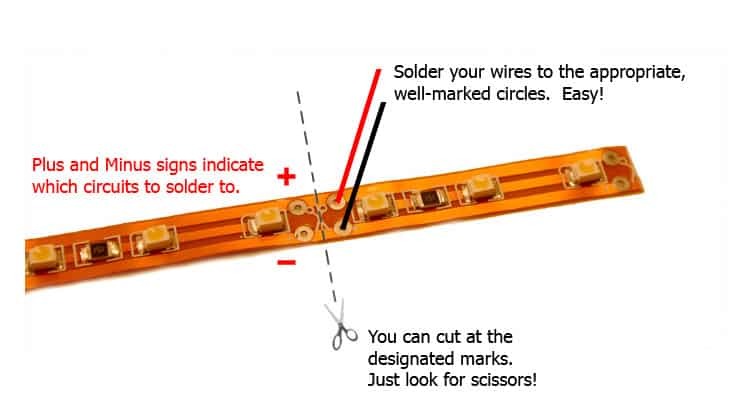 You might think soldered wires won’t stick so securely to something as thin as super thin ribbon LED strips, but as long as your solder is smoldering hot, and your wire ends get encased in the solder, it should hold perfectly! 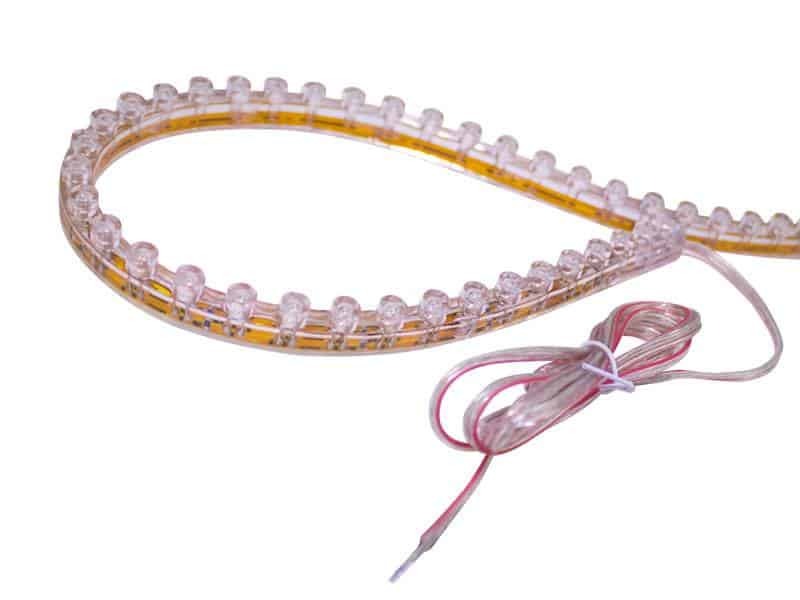 Start by using a little sandpaper to sand down the contact points on your LED ribbon strip. This should make it easier for the solder to grip. Heat the point that you’ll be connecting your wire to and apply your solder. You want it to be really hot, so it should melt and look almost bubbly. Insert the wires so they are covered in solder. Remember, when only one of the solder points is heated and the other is cold, we call this a cold solder joint. Cold solders don’t carry electrical current very well so it’s important that both points are nice and hot! Ok so i bought the thin ribbon strips from oznium and the waterproof ribbon strips. https://www.oznium.com/flexible-led-strips/thin-waterproof-ribbonThe points on my ribbon strips DO NOT look like these: instread they are completely filled. Solder WILL NOT stick to these points and im starting to get a little angry with how unintuitive this product is. It will BARELY hold on, but the second the wire is moved it breaks free. The same thing goes for the waterproof LED strips – but i cant even get to the points without striping the silicone insulation.Thank god this place has a decent return policy. not many people seem to have a problem with these products. and no. this place doesnt have a ‘decent’ return policy. its probably one of the best ive seen from ANY companyif it wont solder, get creative. find a way. or just learn how to solder correctly. I’ve never used them, but if you email customer service I’m sure they will fill you in. For the waterproof strips, you shouldn’t have to be soldering anyway…. I need to cut them in 3 LED increments (both standard and waterproof). You don’t know how to solder then. I have over 20 feet of the rgb sibbon strips in my car (meaning 4 soldering points instead of your two) and I have never had a problem. Go to youtube and search for a soldering tutorial. Practice soldering then give the strips a try…it shouldn’t take more then 45 seconds per strip to solder. Heat, apply solder and line, hold in place while it cools for 5-10 seconds…that’s all there is to it.Youtube for soldering tutorial.EDIT: if you can’t find a quality video on how to solder, reply here and I’ll make one for you. if you really get in a jam drill out the hole and then stick the wire through and then solder the back… it should be easier. It would work but I don’t recommend doing it. 1-You’d probably screw the strip up if you used a drill. 2-It would look messy once you soldered it. 3-The soldered loop could easily tear the strip. 4-The soldered loop would be loose on the strip. I was thinking of doing the wire wrap method, but using some sort of non conducting adhesive (something stronger than hot glue) to hold the wires in place so they wont yank out. Kevin, I demand tutorial now! There are 10,000 on **** youtube. If you do what he says, you’ll have no problems. Make sure you’re heating up the pads on the strip. It sounds like you’re getting a cold solder connection which usually means you didn’t heat the pads. heat up the solder pad and melt a drop of solder onto that. Instantly you should be able to see if it is a cold solder joint or not. If not then tin the wire and connect the two. Try it without the flux. It is possible that the solder pad is too smooth. You could try scratching it up a bit to see if that helps. if it wont solder, get creative. find a way. What kind of solder are you using? You say the holes are filled, are they filled with solder? Can you melt the solder in the hole and insert a tinned wire end? ^^ If it works that way, I would bow to Oz genius. corvette and pwrngr said it perfectly. You must heat the point / soldering point you’re applying any solder / wire to, sounds like someone’s got a shoddy soldering iron that heats to around 100 degrees and not much more. The bloody things should melt and look like lava (I’m trying laymen terms), then insert the wires so they’re encased in solder. If you’re heating the side of the bulge, pushing it, then wondering why it comes off, it’s because you haven’t enough heat. Also: Instead of applying solder to just the tips of the wires then sticking them on when they’ve already cooled (instantly), apply the tip of the iron to the product. Wait till the things bloody hot. Apply solder so it’s a nice bubble on the soldering point. Keep iron there to keep it hot. Apply wire inside, remove iron. It will encase it in solder. Hope this helps. wow he over explains but it GREAT for someone who has never REALLY soldered. I had hobby kits when I was young so I learned LONG ago! it works evenly and easily. the waterproof is HARDER to cut up and use. ALSO the waterproof has a layer on the bottom you can cut off or peel off and access the whole strip and then cut the leds easier and evenly.